Before thinking it unkind to peddle cats with the same dodgy tactics employed by used-car salesmen, watch the video and you will likely be charmed, as a I was, by both the over-the-top mustachioed salesman in the cheesy suit and all of the pre-owned cats he was hawking. Plus, it apparently, worked. The Calgary Humane Society delightfully reported that 34 animals were adopted during their Saturday event,and 106 found new homes the week leading up to the adoption event when the YouTube video was released. Of course, it helps that they were all certified pre-owned. Older cats .... meaning, cats who are no longer kittens, are the best ... I have several cats -- some from kitten-hood == others I took in at maturity === you don't lose anything either way ====== whether you adopt kittens or adopt older cats, you still get really cool animals === age truly doesn't matter much when it comes to cats ===== (your vet, of course, has a different opinion but his/her point of view is from a different perspective). Pledge to adopt a rescue animal...so many dogs and cats need a second chance! I actually thought it was a good video. 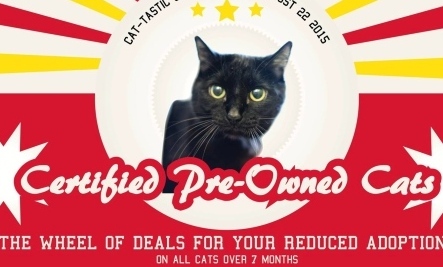 I never would have thought of certified pre-owned! I think it was a good idea. Thanks for sharing. This is just an attention getting marketing tool. If this shelter is good they are still checking out adopters. My local shelter has free senior days every so often and they are always successful. Sometimes the people come in for a free senior and fall in love with a kitten. For every cat that gets adopted there is a space for another cat. This can be critical for kill shelters. There is also low cost spays and neuters and free spay/neuter days for low income towns especially for pittbulls. Things are getting better.